From 1903, when the first census that counted the population in the entire archipelago was undertaken in Bohol, to the latest census of May 2000, Bohol’s population increased fourfold. It took 24 years for Bohol to have a population of 269,223(1879-1903). In the next 45 years(1903-1948), Bohol’s enlarged population was annually adding about 6 thousand persons. From 1960 to 1995, Bohol’s population almost doubled adding about 13 thousand people annually. Only 4 years thereafter (1996-2000), Bohol’s population was increasing by as much 36 thousand people annually. Such rapid population growth, if not addressed immediately, will have alarming impact on Bohol’s resources and environment. With majority of Boholanos depending greatly on its natural resources for their livelihood, the consequences of an ever-increasing population on the environment and, ultimately, in the development of Bohol are alarming and should be urgently addressed. Although Bohol’s population is predominantly young, it is significant to note that its elderly population is growing considerably. Bohol’s population aged 65 and older has grown tremendously, growing by more than 2% annually from 1970-1995. Five years thereafter, about three thousand elderly people were added annually, and are projected to grow as life expectancy of Boholanos continuous to improve; hence, its elderly population continuous to get older. Improvements in mortality at more advanced ages have also accounted for unprecedented survival to older ages. Statistics show that the ratio of elderly population in Bohol to the province’s total population in 2000 is at 68 per 1000 compared to 50 per 1000 in 1970. If current trends continue in the future, this group will make up an average 8 percent of Bohol’s population. As a result, pressures on community resources(e,g. , public transportation, emergency medical services, home care, long term care and income support) and health care expenditures maybe expected to rise. The road network in Bohol is fairly established but far from adequate. Even with the concreting of Bohol’s major circumferential road, more than 50% of its roads are still earth/gravel roads as of 2005. Many of these roads are major distribution links to upcoming eco-cultural and agro-industrial destinations. The interior roads which connect the greater part of the more popular tourist routes are in constant need of maintenance. In the rural area, most of the roads and bridges are poorly maintained due to the limited financial and equipment capabilities of Local Government Units (LGUs) to support such infrastructure facilities. Affordable power rates will surely invite foreign as well as local investors to put up business enterprises, like manufacturing and processing, in Bohol. However, Bohol has one of the highest, if not the highest power rates in the region and possibly in the entire country. This is partly due to high system losses incurred by its major distributions outlets, which in 2002, was averaging at 8 to 10 percent. As of 2001, there were still 15 municipalities not served by level III water systems in the province. Water service is generally limited to domestic use where, in most instances, water is rationed to serve a larger number of consumers. Existing water works systems in Bohol rely on ground water resources. Reduced water table levels has led to water contamination and saline intrusion. Continued a reliance on these water sources would eventually result to inability to meet increasing demand for water and will adversely affect the health of the people. In fact, for several years now, the number one cause of illness in Bohol, especially among children is diarrhea/gastroenteritis. In 2002, only 35% of potential irrigable area in the province has been irrigated. This is ironic since Bohol has vast water resources that still remain untapped. Existing tourist infrastructures are still insufficient to support the growing requirements of the tourism industry such as Tourist Info Centers, restrooms especially along identified tourist circuits, docking facility/complex in Loboc, etc. Present tourist facilities and services have yet to meet the quality standards of international tourists. The absence of health facilities in some parts of Bohol is another problem. Out of 1,109 barangays in the province, only 29% of these barangays have Barangay Health Stations (BHS) where primary health care services can be availed in the rural communities of the province. This could explain the fact that majority (84%) of child deliveries in Bohol in 2001 were done in the home rather than in hospitals or other health centers with only 58% of deliveries in that year performed by midwives. The main causes of maternal death in Bohol could have been prevented if pre-natal care, a basic health service, was available in the community. The combined effects of increased population over exploitation of the land and marine resources, and stagnation of agricultural income contributed to severe poverty incidence among marginal fisher folks, subsistence farmers and landless workers. The poverty situation in the province is alarming. Based on the 1994 income figures, 42.3 percent of the total number of families have live below poverty thresholds of Php5,978.00 per month, which is higher than the regional poverty incidence of 32%. Per NSCB Report based on the 2000 FIES, Bohol’s poverty incidence increased to 47.3% families or 53% of its population. The Provincial Poverty Threshold correspondingly increased over the years. As of 2004 (NSCB), the annual per capita poverty threshold in Bohol was estimated at Php4,651.67 to meet its food and non-food basic needs. Although poverty incidence was estimated to decline in Bohol per UNDP’s 2005 Philippine Human Development Report at 37%, this still remains high with about 87 thousand Boholano families still living below the poverty line. Hunger and malnutrition still pose a major challenge in Bohol with quite a number of children still found to be malnourished at varying degrees. For a province already saddled with poverty, malnutrition starts a vicious cycle of ill health, lower learning capacity, and poor physical growth. Malnutrition is often overlooked until it becomes severe. In 2002, there were over 100 thousand children (6-59 months) found in Bohol to be underweight. This covers more than 80% of children in Bohol of that age group indicating that malnutrition is widespread in the province. Almost 6% of the total number of live births in 2002 in Bohol was fund to have weights of less than 2500 grams at birth. In 2001, malnutrition was the No. 7 cause of death among infants in Bohol and ranked No. 32 overall mortality cause. The prevailing high rate of Diarrhea/Gastro-Intestinal Illness in Bohol is a poor quality of drinking water in majority of the areas in the province especially in its component-inhabited islands/islets. Health statistics reveal that about 39% of households in Bohol in 2005 have no access to potable water. The high prevalence of said diseases in the province is mainly due to contaminated (particularly from human waste matter) underground water supply, the major source of drinking water in the province. Per records obtained from the Provincial Health Office, more than 18% of households in Bohol in 2005 were still without sanitary toilet facilities. Also in 2005, gastro-intestinal illness was still leading cause of illness among infants and adults. It is among the top leading cause of death among Boholanos in that year. 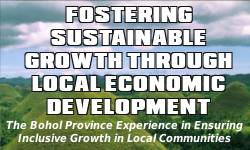 This can be attributed to the low level of investments in the province particularly in areas of high labor absorptive capacity attributed to a number of factors such as the inability to utilize fully tourism as an engine of growth for the local economy, inadequate infrastructure support and timidity of Boholano entrepreneurs to invest in the province. While tourism is one of the promising sectors, much is still needed towards increasing the attractiveness and appeal of Bohol, i.e. , upgrading tourist services, enhancing promotional activities, or improving support facilities. Adequacy of infrastructures facilities has a strong influence in the location decision of investors. Moreover, investors’ confidence is boosted when local entrepreneurs become major stakeholders in local investments. The last two concerns hardly prevail in Bohol. The primary source of revenues for most LGUs is still the Internal Revenue Allotment (IRA), although efforts are being pursued to tap other sources envisioned under RA 7160, particularly the creation of economic enterprises. Unfortunately, the greater part of these LGUs’ revenues are devoted to Personal Services. As a traditional revenue source, local taxation often evokes negative reactions from the populace, while government-run-economic enterprises often suffer from credibility problems and the inability of the LGUs to provide professional and entrepreneurial management. If this continues, LGUs would be unable to provide for most of its basic public to a greater number of its constituents. I am Armando Mendoza, and am interested to prepare a study on how to effectively produce potable water using the existing deepwells as feedstock source for the treatment systems. The treatment system will have to be decentralized that can serve a group of barangays, and thus may need to set up a number of the treatment systems within the affected municipalities. We can rely on new technologies on treating a combined ground water with high saline contents. I am available for initial discussion via email. Thank you for your interest in contributing to the development of the Province of Bohol. The Provincial Government of Bohol is discouraging further development on the use of ground water as it is deemed unsustainable. However, your proposal may still be applicable to some waterworks systems that supply water to their communities. You may want to present your proposal to these agencies at the municipalities. Good Evening, is there any proposals regarding the said problems in tourism? It is quite interesting to choose Bohol to be my subject in our Thesis Proposals. And, if ever, are there informations provided for us to conduct a study? Thank you. Please refer to the Bohol Tourism Office.